in association with UCCE Master Gardeners of Santa Clara County. Registration will close on Sun, May 05, 2019, 3:00 pm. Note: there will be no e-mail help available on the tour day. Click here to preview the gardens on the 2019 tour. Since 2003, the Bay Area's pioneering native garden tour has showcased gardens featuring California native plants. This community-based tour is free of charge to the public. Each tour features up to 60 gardens, most of them private home gardens, which are open on tour day in a do-it-yourself, open house format. 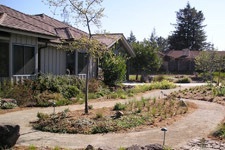 The gardens on the tour demonstrate reduced water use, reduced chemical and pesticide use, improved habitat, and the unique aesthetic appeal of gardens designed with California native plants. Our website also provides resources to help Bay Area gardeners to “go native” in their own gardens. On tour day, sponsoring nurseries will conduct native plant sales at select gardens. Part of the proceeds benefit Going Native Garden Tour. Please pay by cash or check. Tour volunteers can visit tour gardens throughout the year through a series of Garden Preview events and receive a custom GNGT T-shirt with artwork that changes yearly. Tour volunteers work one 3-hour shift on tour day at one of the gardens either as a docent or as a greeter. 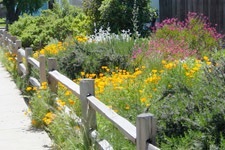 If you live in Santa Clara County or San Mateo County, and California native plants are a significant percentage (60% or more) of your garden, we invite you to submit your garden for inclusion in the Going Native Garden Tour 2020. The submission deadline is Fri, Nov 15, 2019, 11:59 pm. Click here to submit your garden. Additional details are on the How do I submit my garden to be included in the Tour? page.